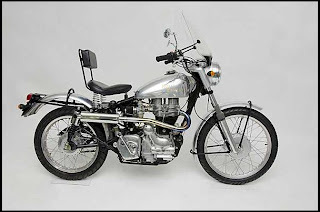 Fine looking Royal Enfield with bad looking backrest. A 2003 Royal Enfield Bullet fitted with the trials kit, a windshield, solo seat and — oh, no — a backrest goes up for auction Thursday, Aug. 18, in Monterey, Calif. 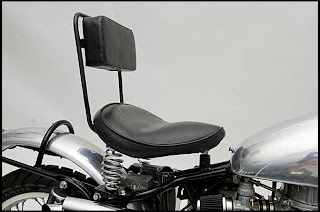 It's the backrest that arrests my eye, although you might just as well wonder why a trials motorcycle needs a windshield. Back rest suggests rider is past his days competing in trials. The photos provided by the Mecum auction seem to put particular emphasis on the backrest, even illustrating what a simple addition it is to the sprung solo seat. Backrest bolts neatly to bottom of the solo seat. 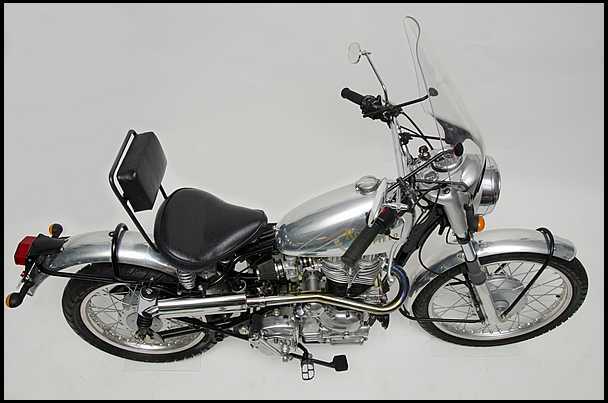 The motorcycle is among those being auctioned off from the immense collection of Barry Solomon. The auction catalog states: "Built new in 2003, this 1955-specification, 500cc single-cylinder Trials Bullet Replica comes with 12-volt electricity both electric and kick starter and telescopic forks. Its polished aluminum body and custom muffler and exhaust pipes are reminiscent of the Trials bikes made over 50 years ago." Fair enough. But comfortable as the backrest may have been for the rider, it's painful to the eye. Backrest sticks out like a sore thumb. I'm not here to poke fun at anyone's taste, or suggest that someone with a bad back should suffer just to keep an ugly accessory off a good looking motorcycle. However, I do wonder if removing the backrest before the auction might not actually increase the price the Bullet brings. If you're interested, the Bullet is Lot T218. It is due to cross the stage at 6:50 p.m. Thursday, Aug. 18 at the Hyatt Regency Monterey Hotel and Spa on Del Monte Golf Course, 1 Old Golf Course Road, Monterey, Calif.
"The collection consists of 70 motorcycles from 1902 through 2004, including the bike that started it all, a blue 1948 Whizzer that he couldn’t afford as a youngster. "Two 19th-century bicycles will also be offered, an 1885 Penny Farthing high-wheeler and an 1899 Pope Columbia chainless bicycle. Many other motorcycle manufacturers who have long since disappeared are also featured in the collection, including a 1923 Condor, a 1930 Terrot, a 1929 Baker, a 1952 Rabiniek, and a 1936 Sparta. 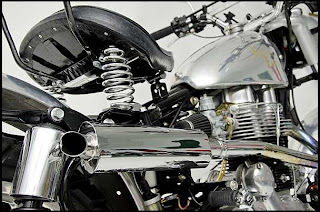 "Of course, in such a large and diverse grouping of motorcycles, there are bound to be Harleys, Indians, Nortons, Ariels, NSUs, Ducatis and BMWs, and Barry’s collection doesn’t disappoint, with representatives from each company. Kind of makes you wonder just how many bikes he bought after he acquired his childhood dream." Yup...back-rest and fairing gotta go...ugh...WTF?